These evenings are a chance for anyone coming to the Centre to get together for our mutual entertainment and enjoyment, as well as to raise funds for the Centre. 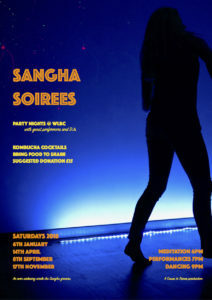 The evenings will include meditating, eating, fifth precept (non-alcoholic) drinks, performance and dancing. They are also a chance for us to share our talents with each other. So if you are a musician, dubpoet, filmmaker, painter, bodypopper, magician or otherwise unclassifiable artiste, please get in touch and we will add you to our roster of stars. Your hosts are Vilasamani and Carolina Alonso. Feel free to invite conscious friends, and bring vegan food to share. Like us on Facebook for further updates, photos and playlists. Please make donations here. Contact Vilasamani[at]mac[dot]com / 07973 309623 if you would like to perform or help out on the night.